Three down and five to go in the 8-game stretch of winnable games that gives MU the inside track on heading into UConn Feb. 18 at least in 2nd place in the Big East. Perhaps more importantly, the 0.71 points allowed per trip vs. South Florida culminated a 6-game stretch of excellent defense that put in MU in the top 20 of all defensive teams, which Rob pointed out Wednesday is the average for an Elite 8 team. But can the much improved defense beat a team that is great at the one thing MU has been unable to stop since Otule's injury - offensive rebounding? While Maalik Wayns is the 15th best player in the league statistically, it is 6-foot-10 Mouphtaou Yarou (33rd best) and his back-up 6-foot-9 freshman Markus Kennedy have helped make Nova the 23rd best offensive rebounding team in the country and 11th best among BCS teams according to Pomeroy. While MU is clearly the better team Saturday (11 a.m. tip-off), MU has been the much better team in all three games against teams ranked 23rd or higher in offensive rebounding (Nova first game, Pitt and Washington) and has barely survived all three games. This is the first time we go up against a dominant offensive rebounding team ON THE ROAD. MU seems to either be unable to keep these teams off the glass (45.7% offensive rebounding first game vs. Nova), or have to crash the defensive boards so hard that the offense can't get going in transition (vs. Pitt). Since Chris Otule was injured MU has plunged to 279th in the country (35.4% offensive rebounding allowed). Put that together with Nova's offensive rebounding, and Nova projects to grab a scary 41.9% of their own misses. (You multiply the deviances of the offense and defense from the national average then multiply that figure back by the national average if anyone cares). In Milwaukee, Nova only fell short by 4 points because they hit only 3 of 17 three-pointers. With the average 8-point swing from one home court to another, that gives Nova a 4-point edge, while Pomeroy projects a 4-point Marquette win. The good news (again, pointed out by Rob Wednesday) is that MU is coming off its best defensive performance ever in Big East play under Buzz. 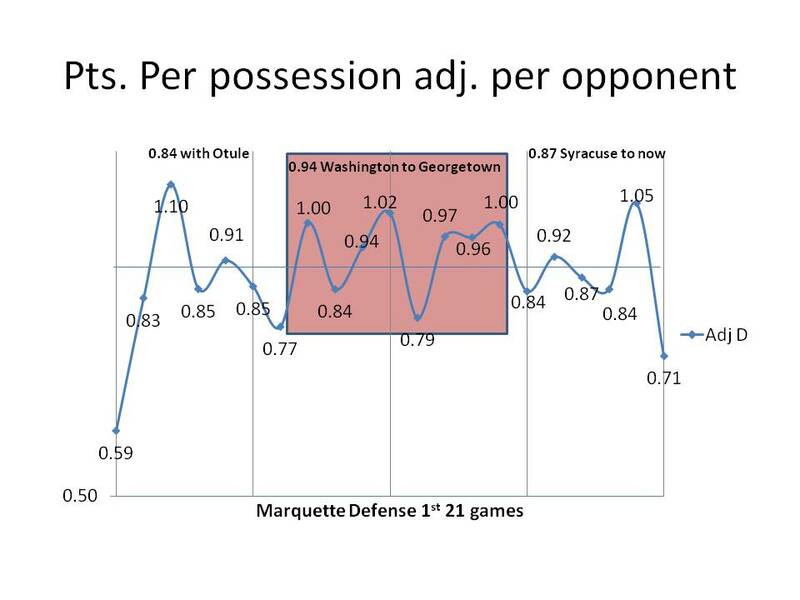 As the chart above shows, the 0.71 adjusted points allowed per trip against South Florida was even better than the incredible defense played against Wisconsin (0.77) and UW-Green Bay (0.79), though not as good as the manhandling of Mt. St. Mary’s to start the season (an 0.59 even after adjusting for Mt. St. Mary’s well below average offense). It gets tougher after that, but if the defense keeps playing well, the final few weeks could be fun. Here is the game-by-game defense for the season. For perspective, below are the Top 5 defenses in the land. With Otule, MUs 0.840 was better than any defense except Ohio State and Wisconsin. 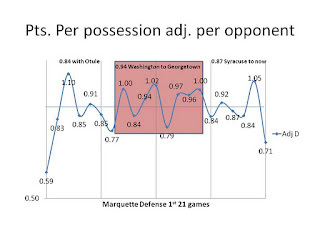 The first 8 games adjusting to Otule's absense, MU was only as good defensively as the 59th best defense (Indiana). In the past 6 games, MU's defense has been as good as the 8th best in the land - UNC.